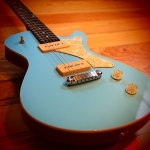 Frank Hartung "Junico", sonic blue, SOLD! Frank Hartung "Junico", Black-Top, SOLD! Frank Hartung "Junico", vintage white, SOLD! Frank Hartung "Junico", Blacktop, available MAI! ON HOLD! Frank Hartung "Junico", TV sonic blue, SOLD!